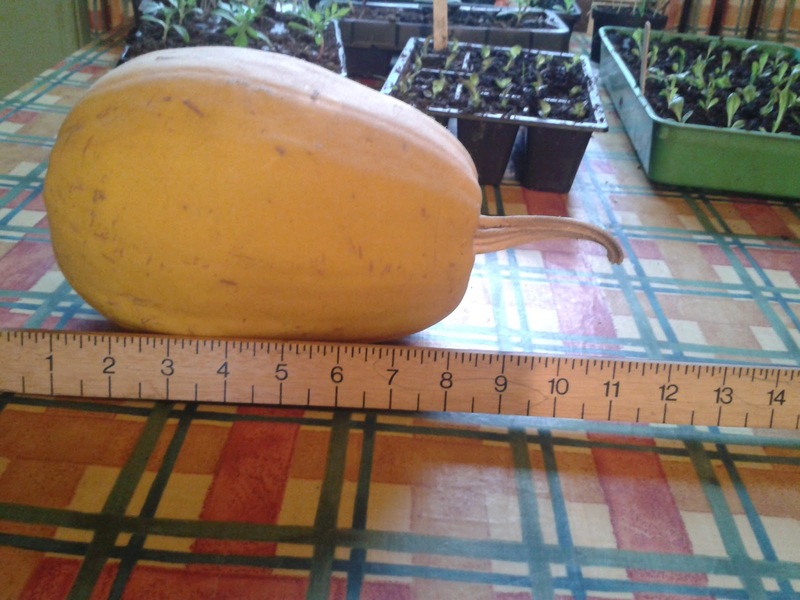 Last year my friend in Cornwall gave me a couple of Spaghetti Squash plants. they grew quite well, but I used them young as ordinary squash and before they had "spaghettied"
Has anyone out there in frugal/ cooking/ smallholder-Land a favourite way to cook the little beauty ?? I've Googled it (obviously) but don't feel too confident/inspired with the results so I do hope someone out there has some ideas as I don't want to waste it !! I have three plants started off in the greenhouse for this year in the hope that it's a winner! Below is a picture of the contents of my fridge (milk, butter, marg not shown) it is an old fashioned one that has to be de-frosted ( not good for a non-domestic goddess like me) so I usually give it a good sprockle when I defrost it. The last week has been a little expensive and I have literally coppers left in my purse. That doesn't mean I am not solvent , it just means I have used up the money I told myself I would manage on. So it will be no spends until Sunday and we'll live on what is in the fridge. So, as you see, lots of veg from the drawer. Some lamb bones with quite a bit of meat on them, A jug of gravy, mashed potato and cooked beans and carrots, sweet corn, cheese, a cooked thick bacon steak and a couple of cooked sausage and a pint of cheese sauce. I've also got a 2.5kg of potatoes and three loaves. Dinner - Lamb in gravy with mashed potatoes, carrots and cabbage. Day 2 - Lunch - Cheese on Toast. Dinner - bacon and sausage pasties with bubble and squeak. There is still the makings of a coleslaw and plenty of bread and cheese left for snacks and you should see what the chickens will do with those bones ! 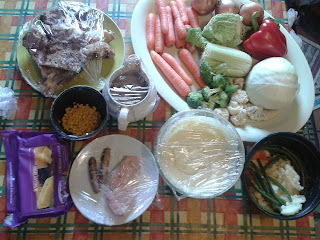 We have another few hectic days coming up, so it is good to have the meals planned. Off to our local Smallholder's Association AGM tomorrow night. There will be a visit to a member's free range chicken farm first, which I am looking forward to. I cut them open from end to end and scoop out the seeds. Put them face down in a baking dish of water and cover. Bake them (steaming in water) until I can pierce the shell with a fork. Shred and serve. I've never grown my own. We grow crookneck squash, pattypan, and zucchini in our area. I grow quite a few squash-type plants and try to grow something different every year. My new grow this year is "Crown Prince" pumpkin/squash. I shall blog a list of the others over the weekend as the frosts are finally over, so I can plant out the sensitive plants. I have never grown Crookneck. ooh that's a biggun! I love squash, with chick peas in a curry best. I nearly always add squash to curry, especially my home grown lamb ones. I cook a squash and potato curry too, adds extra roughage and richness to curry doesn't it? I cut them in half and brush olive oil on the cut surface which I put face down and bake until it can be pierced with a knife. Shred and serve with butte, pepper and Maldon salt. Thanks for that Lizzie. Hope to try it within the next week. What about the seeds? Do you do anything with them?